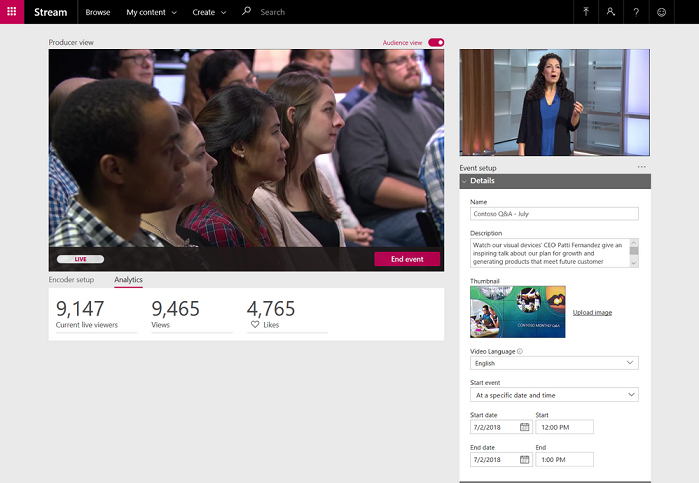 You can create live events using Microsoft Stream across the organization. You can schedule, produce and deliver live events for a variety of scenarios such as companywide events, leadership updates and more. Live events enable producers to curate and control the content that is broadcast to an audience. You can create, schedule and run live events using a single bitrate RTMP or RTMPS stream from an encoder – we’ll take care of all the transcoding for adaptive bitrate delivery to your viewers. Just like any other video in Stream, you can make the live event open to your entire company or limit the access to specific groups or people. This provides an end-to-end creation and viewing experience inside of Stream. Speaker timeline uses face detection to identify who is talking, so you can easily jump to a particular speaker in the recording. Transcript search and timecodes let you quickly find moments that matter in a video. You can create a live event in Stream, Microsoft Teams or Yammer — wherever your audience, team, or community resides. Attendees can participate in real time, with high-definition (HD) video and interactive discussion, or catch up later with powerful AI features that unlock the content of the event recording. Seamless integration across Office 365 means that you can use Stream to deliver highly produced, studio-quality events. Learn more about live events in Microsoft 365. Ensure that users you want to be able to create live events have the granted permissions required to create a live event. By default, everyone in your organization can create a live event, however a Stream admin can restrict access. Learn more about live event administration. Go to Admin settings > Live events. Go to Create > Live event. Follow the instructions in Create a live event in Stream. As an organizer or producer you can monitor the audience engagement in real-time. Quickly toggle between audience and producer views to see different screens and monitor analytics like current viewers, likes and total views for your event. 1 The Stream admin can restrict permissions to create live events. 2 You must be a group owner to create a live event in Yammer. 3 Number of live events and attendee counts are subject to change and dependent on service availability. 4 Live events are subject to storage usage in Microsoft Stream. The size of the post-live encoded top bitrate, used also as the downloadable recording, is used towards storage quota. Licensing overview. Live events in Microsoft 365 is a highly available service and you can expect good performance at scale. In the very unlikely scenario that results in failover being required, live events using external encoding will not have redundancy and are not be recoverable.